Visit your local Walmart to grab your copy! Thanks. Anybody try that Yum Dynasty frozen meal? POSITION rack in centre of oven, then preheat to 350F. Spray 3 9-in. round baking pans with oil and line bottoms with parchment. WHISK hot water with molasses in a medium bowl until smooth. Whisk in baking soda. Set aside. WHISK flour, ground ginger, pumpkin pie spice, baking powder and salt in a medium bowl. WHISK eggs, oil and sugar in a large bowl. Whisk in molasses mixture. Gradually whisk in flour mixture just until smooth. Divide batter amongst prepared pans. Bake until a toothpick inserted in centre comes out clean, 20 to 23 min. Cool in pans on wire rack for 10 min. Run a knife around edge of pans and turn out onto the rack. Remove parchment and cool completely, about 1 hour. FOR ICING, beat cream cheese with 1/3 cup sugar in a large bowl, using an electric mixer on medium, until sugar dissolves and the mixture is smooth, 1 to 2 min. Reduce speed to low and slowly add cream until combined. Increase speed to medium-high and beat until stiff peaks form, about 3 min. (Do not overbeat). Scoop 1 cup icing in a piping bag fitted with a 1/2-in. or 1-in. star tip. DECORATE with a fresh wreath or, for something different, pipe 12 rosettes along the top edge of the cake and top with gingerbread cookies. To make the wreath, dip sprigs of rosemary, as well as cranberries, blueberries and pomegranate seeds in egg white, then in sugar. Shake off the excess sugar and place delicately on the top of the cake in a circle. TIP Cake can be made 2 days ahead. Wrap in plastic wrap. Make icing just before assembling the cake. 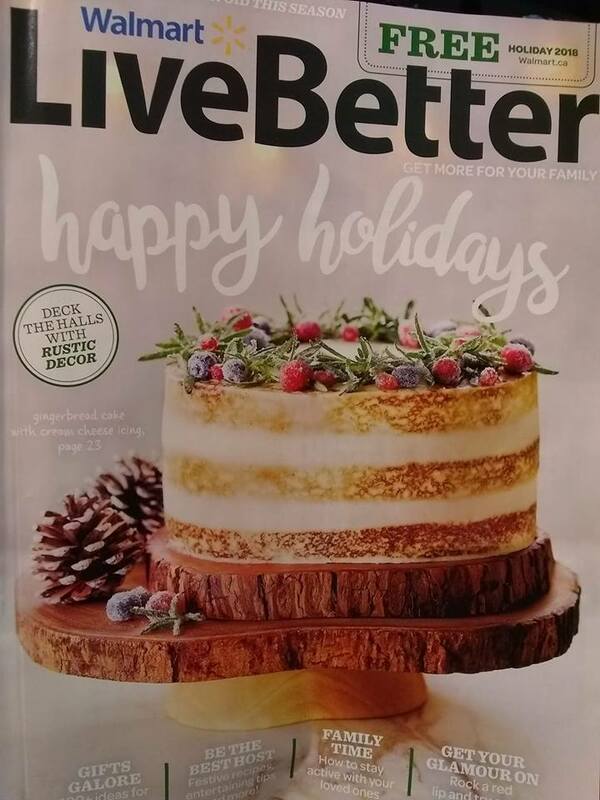 Are they still publishing the Live Better magazine for distribution in the local stores? When is the first issue (spring) for 2019 coming? We had wondered since we haven’t had a printed copy of the weekly flyer, whether they would continue with the magazine in print? Tx.